An American Between Worlds: Because Language Really Does Matter! Because Language Really Does Matter! This is a quote from 20 year old Fidele Harfouche, a native-born Lebanese who has been living in the U.S. since she was 6. She is one of many voices sharing their experiences in a May 7th article in the New York Times about how the younger generation in the United States is appreciating and embracing their families' languages more than ever! This is absolutely fabulous to hear! And the fact that the NY Times is reporting on it is even more exciting! This means that the word is spreading (pun intended). But why are they reporting on it? Because the University of California, Los Angeles, with financing from the United States Education Department, "is conducting the first national count of college programs geared toward heritage students, most of whom grew up speaking a language other than English at home." The research was sparked by the fact that while enrollment in certain foreign language courses was dropping over the past decades, enrollment in other language courses has exploded during the same period. The correlation appears to be linked, at least in part, with students who want to "relearn" the language of their youth, their "heritage languages." We should remember this when we hear our children complaining about us speaking our languages with them. 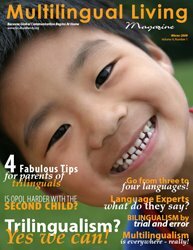 They may be annoyed right now, and perhaps we will have to learn how to work with our children to find the right balance of when and where to use which languages, but in the end we should remember that a time will most likely come in their lives when they will look back and thank us for being consistent in our language choices. "in most cases, it takes heritage speakers just a few semesters to reach a level of sophistication that beginners take years to achieve." This, families around the world, is what it is really all about, isn't it?